Summer in America brings out the flags and other patriotic items in red, white and blues. 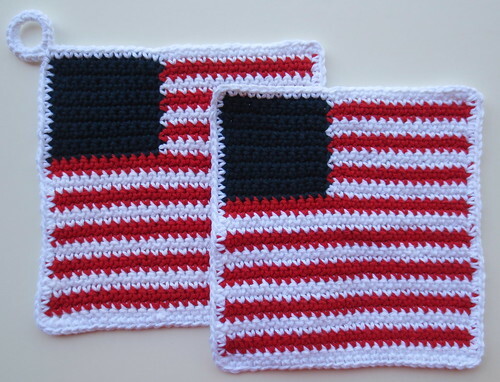 It’s fun to decorate and use the colorful patriotic items around the house and at picnics. So with that in mind, I thought I’d crochet a few dishcloths and potholders. 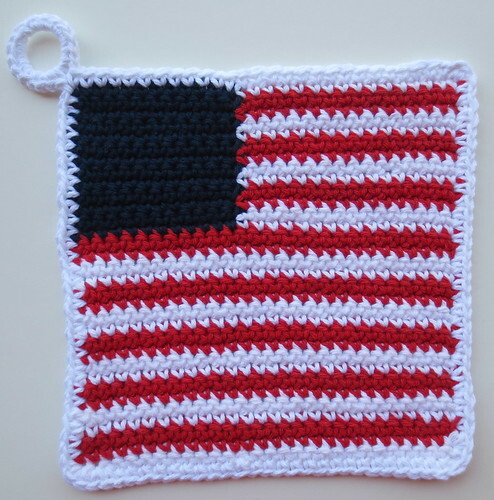 I used my US flag dishcloth pattern to crochet the potholder and matching cloth. For the potholder, I recycled a plastic water bottle ring and just single crocheted around the ring and joined with a slip stitch into the corner to finish off the hanging loop. Below is the finished off flag kitchen set. The potholder and dishcloth measure a 8-1/2 inch square and requires one ounce of white and 3/4 ounce of red cotton along with about 1/4 ounce of blue for each project. I crocheted these using a G (4 mm) crochet hook for a tighter stitch but you could also use a H (5 mm) crochet hook for a slightly larger finished-off item. The crochet pattern is free and may be used for personal and charity projects. Please just don’t sell or post the pattern on another site. Thank you and enjoy the pattern. Awesome potholders 🙂 Really great idea, I like them!